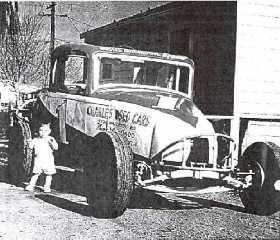 A 1960 PHOTO OF A STOCKTON HARDTOP, DRIVEN BY TRACK CHAMPION JOE GIUSTI OF STOCKTON. A RADICAL FEATURE OF IT'S DAY WAS A RADIATOR FITTED INTO THE REAR OF THE CAR FOR PROTECTION. THAT'S JOE'S SON PRIMO BY THE DOOR.